When decorating a home one should not be afraid of bold solutions. Our hints will help you to choose, arrange and maintain mirrored furniture, so you can enjoy the beauty of your home design for many years to come. 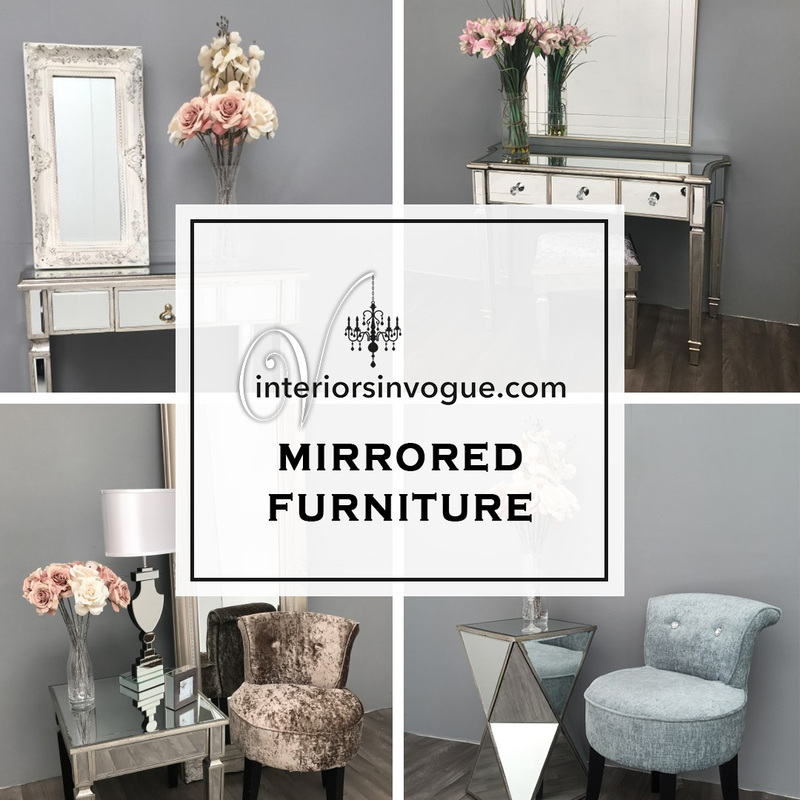 Check out “Interiors InVogue” five reasons to find out why you should buy mirrored furniture. These days, it’s hard to find space for something decadent, but that’s precisely why you should look for furniture that will make your bedroom stand out. So why not dress up your bedroom in a fairy-tale style? Imagine how your bedroom could look like with matching mirrored bedside tables or a shimmering dressing table. Shouldn’t your home decor be about fun and a little luxury to enjoy every day? Of course, it should! Mirrors are a great way to let light in especially into corridors which natural light cannot reach. They not only look beautiful but are a timeless and functional piece of your home decor. Venetian mirrors are exquisite and rich in form, and their frames are usually very sophisticated being decorated with delicate engravings in the shape of leaves or inflorescences. If you’re looking for a grand style and uniqueness, a Venetian mirror will help you achieve it. Mirrored furniture is quite simple to maintain. Sure, you need to be careful not to drop a 10-pound rock on it but then again how often do you throw one at your home, right?! Anyway, a simple cloth will help you remove dust from the surface every so often. We would also recommend using anti-dust sprays that will help you keep the surface dust free for a little longer. Mirrored reflections have a wonderful feature, which cannot be overestimated – they can “stretch” space. Even small mirror piece of furniture (dresser, table, bedside table) can do wonders in a tiny interior. Larger pieces of furniture made of a mirror surface, are the best when they remain dominant in the room. To “stretch” a small space you should avoid cluttering it with additional tables or chairs. You can also achieve this effect if you focus on smaller consoles and vanity cases only. When chosen carefully they will blend in perfectly and will give your interior a unique look and style. We would recommend however not to combine big and small mirror furniture in one room as they may seem overwhelming. If you decide for a mirror chair or side table, why not pair it up with a classic chest of drawers. Mirrored furniture is the ultimate example of stylish, sophisticated design and… convenience! That’s right! No need to look for a specific colour of wood to match ten other items in the room. Mirrored surface works with everything. It will also emphasise the beautiful arrangement of textiles in your place. It works very well with any crystal chandelier so if you’re wondering what would best compliment your elegant home, look no more. Mirror furniture is the answer! Follow current trends, achieve glamour look that everybody’s after and amaze your friends and family. Its furniture appearance matches both modern and traditional interiors, and its reflective features will bring any room to life!